What a great way to begin my sojourn in France! 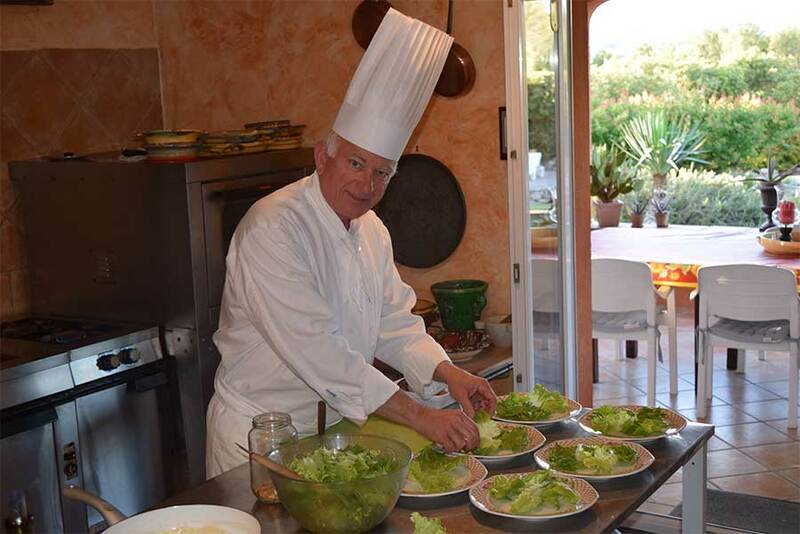 In LYON…a city with its very own traditions……the city known for its traboules, the Guignol puppet character and many culinary specialties. I was in heaven! 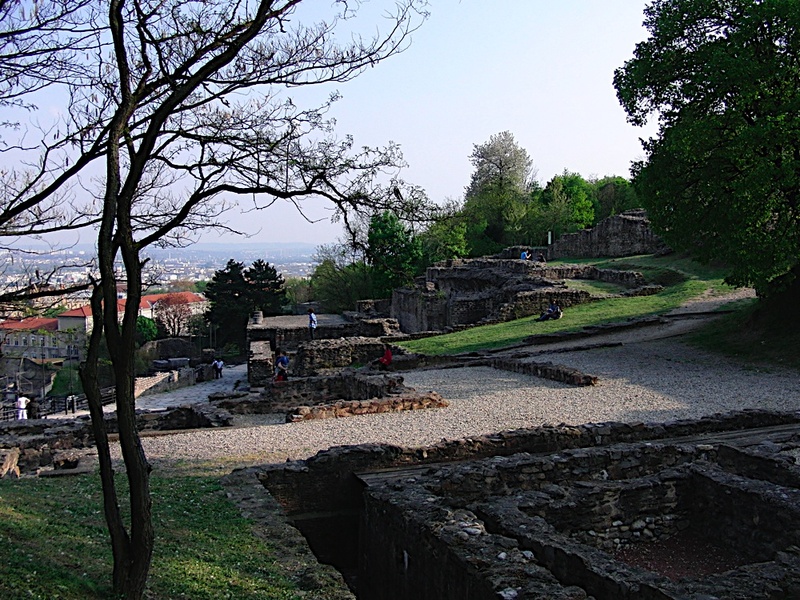 The visit began where Lyon began as a Gallo-Roman settlement known as Lugdunum. It sits at the top of Lyon and looks out over the Rhone and Saone Rivers……yes, you can see there was a reason for the Romans to settle here at the time of Augustus..all this water that comes together … But this is just one of the many Roman sites in France….there are sites from Aix to Arles to Glanum to Nimes to Orange to Vaison up to Lyon and actually all the way to Paris and beyond. 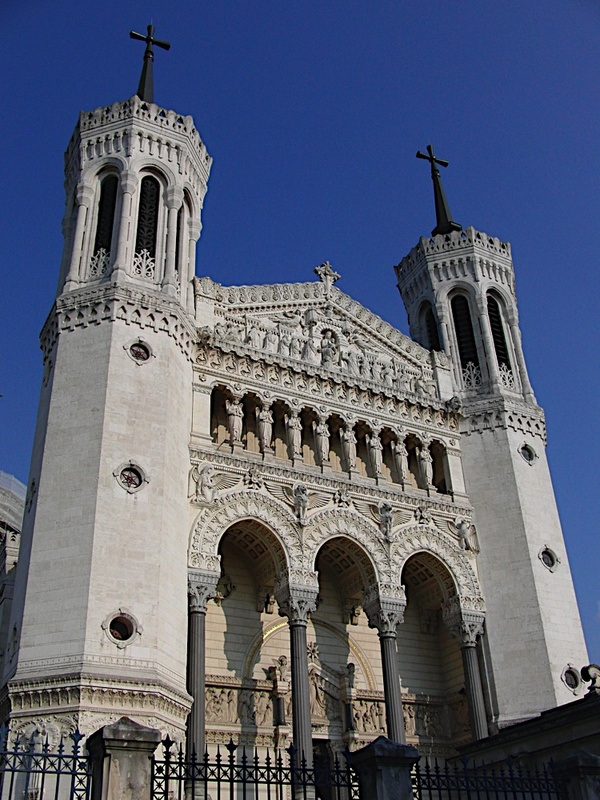 Also here at the top is the Basilique Notre Dame de Fourviere…..not old by European standards…built with private funds between 1870 and 1896, it is perched atop the Fourvière hill, and looms impressively over the city of Lyon, where it can be seen from many vantage points. And now, we head down the hill to Vieux Lyon, the medieval and Renaissance quarter that extends along the west bank of the Saone River at the foot of Fourviere hill. And, by the way, if you are ever traveling the autoroute through Lyon, the long tunnel is cut under this colline and yet I saw no evidence of it while walking the streets. 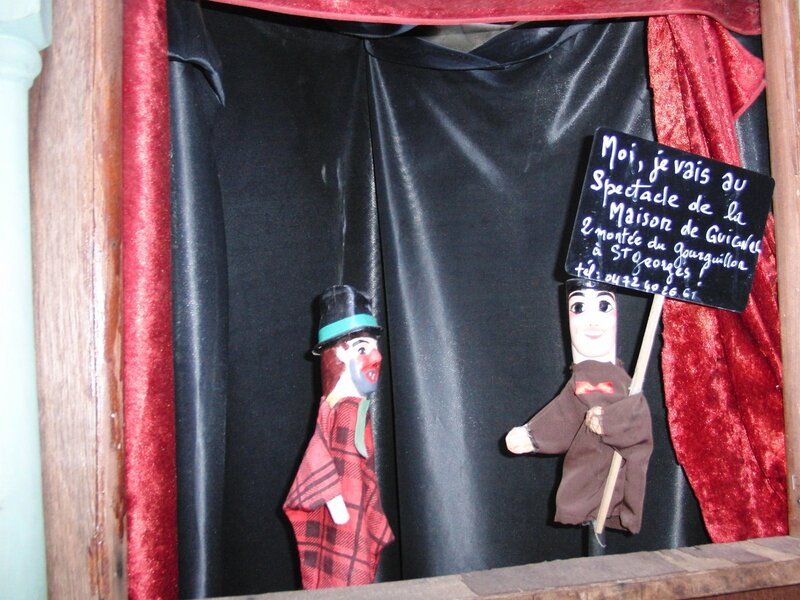 This little fellow probably looks familiar…..he is Guignol, the famous Lyon marionnette. When hard times fell on the silk trade during the French Revolution, a local silk maker became a peddler, and then later started to practice dentistry (yep, from peddler to dentist!) which in those days was simply the pulling of teeth. The service was free; the money was made from the medicines sold afterward to ease the pain. To attract patients, he started setting up a puppet show in front of his dentist’s chair. Dentistry is not part of the theaters today but several of these marionnette theaters are tucked into the streets of Le Vieux Lyon and are enjoyed by young and old alike. And, of course, there are artisan shops where one can purchase a puppet to take home. 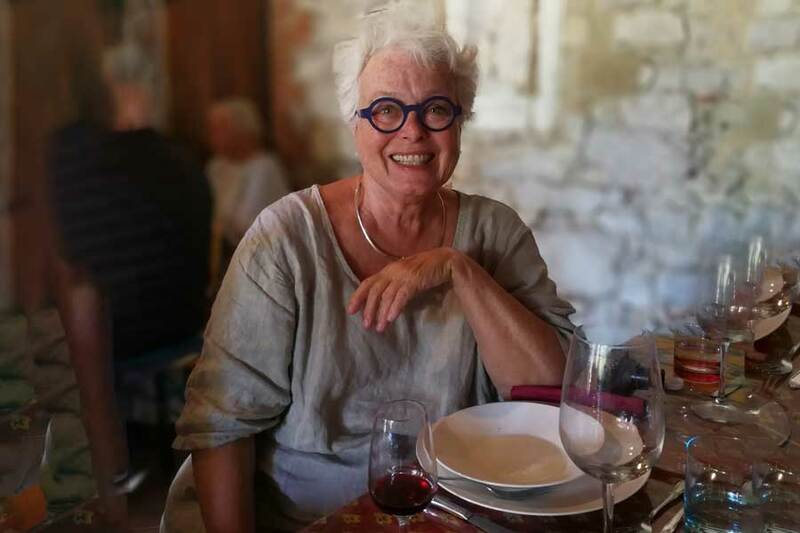 NOW….let’s talk about dinner in Lyon. 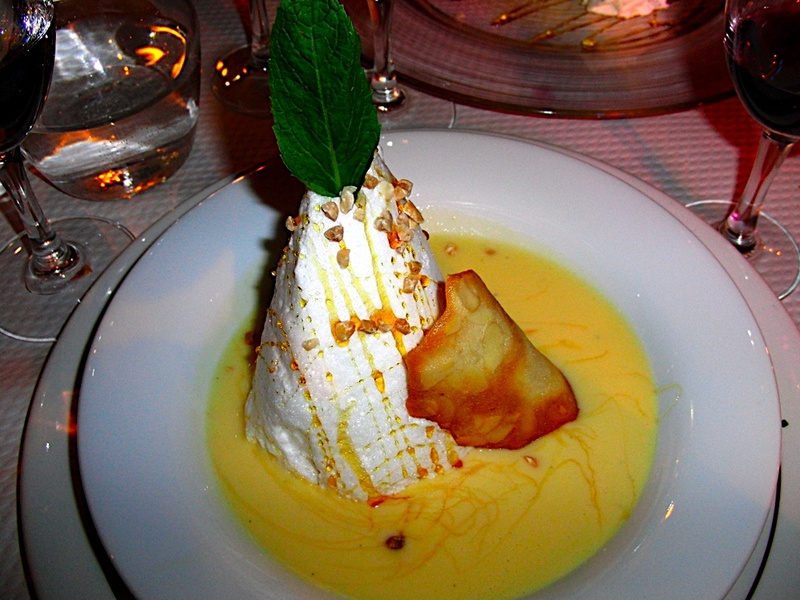 Outside of Paris, but perhaps even more so than Paris, Lyon is known for its gastronomy. Yes, it has its Michelin starred restaurants but Xavier and I wanted to enjoy a bouchon Lyonnais. And no, I am not talking about a cork for a wine bottle or a traffic jam. 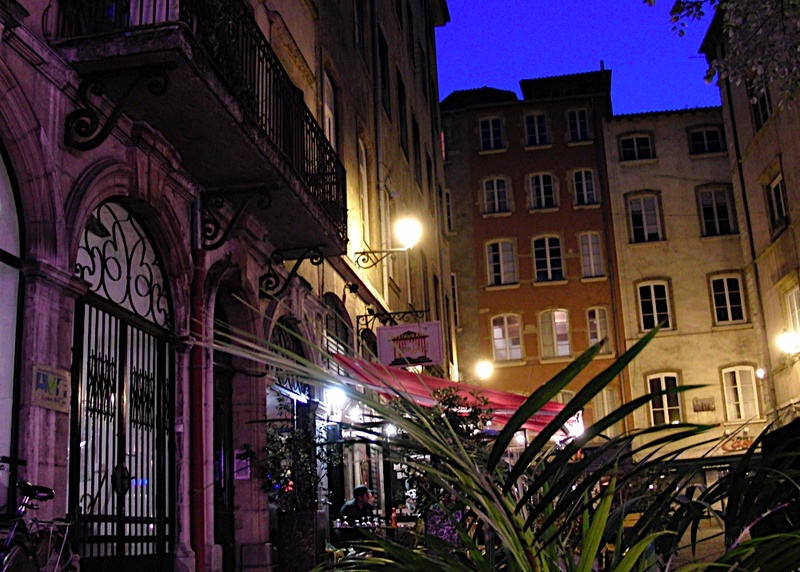 In Lyon, a bouchon is a small restaurant, actually certified to be a bouchon, serving food typical of Lyon. Decisions, decisons….which one? We looked like lost tourists as we circled the streets and alleyways, reading menus, observing the various establishments and seeing who went where. At last, we settled on Aux Trois Maries and we were greatly rewarded with our choice…It WAS FABULOUS. What did we have? First things first! We began by ordering the wine ….’un pot du beaujolais’ which happened to be a Chiroubles. (center photo) It arrives in a thick bottomed bottle (un pot) that dates back to 1850 when the furniture makers of Lyon had trouble making a level table. Thus they created a heavy, stable bottle out of necessity. (Me thinks the furniture makers might have had too much of what was in these bottles ) Oh well, this beaujolais from Chiroubles was delicious. Note the bread in the photo…..larger than the usual French baguette, this is a Lyonnais baguette……larger! 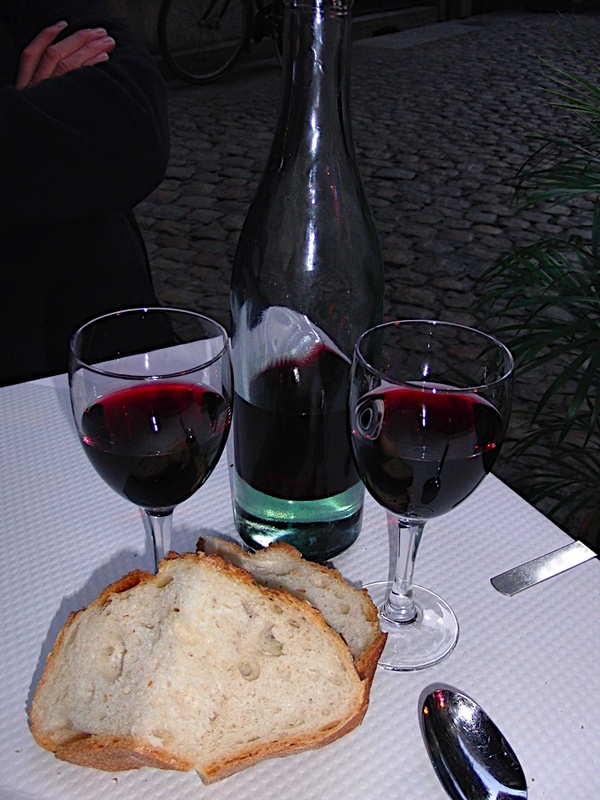 Great traditions….bottles and baguettes…..
MAIN COURSES!….Xavier’s choice was Tablier de Sapeur ( Fireman’s apron? )….which told me nothing. Once I found out that it was cow stomach (tripe which I usually do not care for), I decided not to say “I’ll have what you are having”!..BUT once it arrived, of course, I had to taste and it was absolutely delicious. To prepare this (I know you need to know, just in case you want to fix it at home! 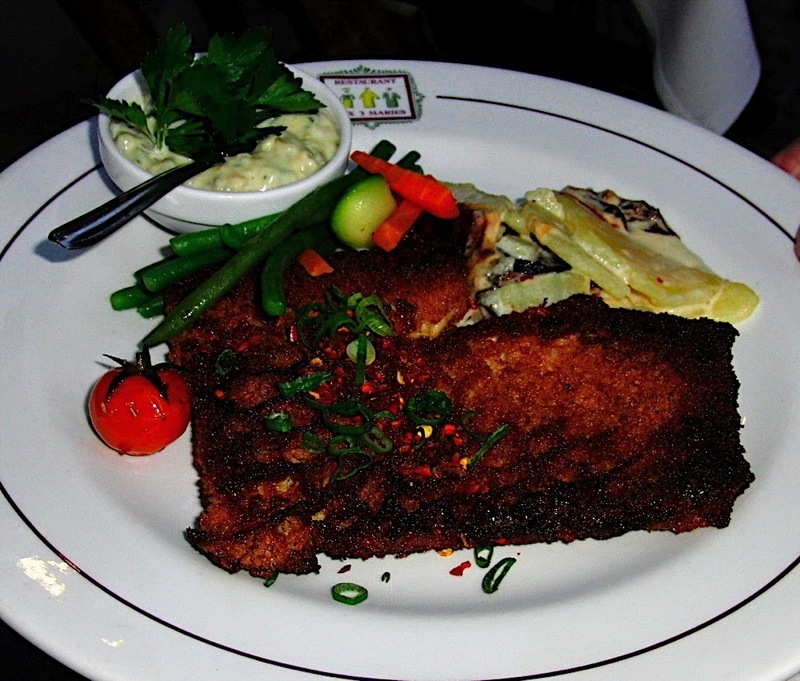 ), you take a rectangle of the prepared honeycombed tripe, bread it with panko-like bread crumbs (they actually make their own from leftover bread), and pan saute til crisp…serve with a sauce gribiche and gratineed potatoes and you are in heaven. I would order this the next time! Now for my choice.. I had ordered the quenelles which are a classic Lyonnais dish but, alas, it would take 45″ to an hour to prepare….we did not want to wait, so I settled for a Cassolette de Fruits de Mer avec Sauce Homard. It was great…the sauce was sublime. Now just when we did not think it could get any better, we decided to order dessert….something I never do, but the Iles Flottante were talking to me. It is a favorite for me because it is so light, but often I am disappointed when it shows up in a parfait glass. Not in Lyon! As you can see, it arrived standing tall on a sea of Creme Anglaise..PERFECT! So what made us choose this bouchon?Well, when we had been circling, looking at menus, we immediately dismissed those that had menus so large that they must not be prepping and preparing all the food on premise. We also peeked in a few doorways. But when we checked out Aux Trois Maries, the menu was small, compared to others, but seemed to be geared to the classics. And, then we noticed an older couple arriving and they appeared to be regulars. Finally, when we stepped inside, it was spotless. Decision made, and it was a good one!